Being in the same first-year program of law school, Kyle Mersky had evidently taken notice of Helene Weiss. “She sat across from me in one of our classes. She was clearly smart and distractingly pretty,” he recalls. However, it was a chance meeting at a pizza place with friends that actually brought them together. “I could barely eat my pizza because I couldn’t stop laughing at how funny he was,” Helene says. “We became quick friends after that.” Over time, their friendship blossomed into love. 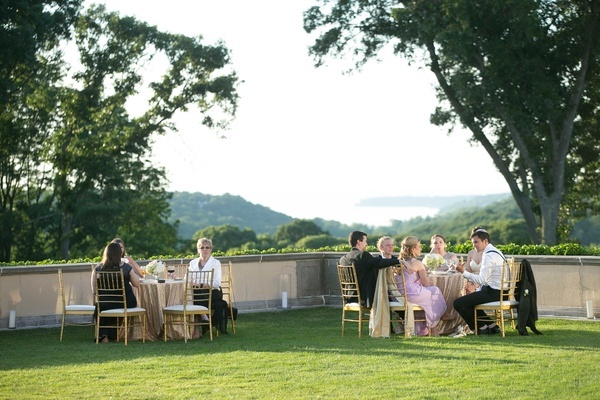 After a romantic proposal, complete with a rose petal-strewn picnic overlooking the lake of her grandparents’ home in Monticello, New York, Helene was pleasantly surprised by the ease of orchestrating their nuptials. 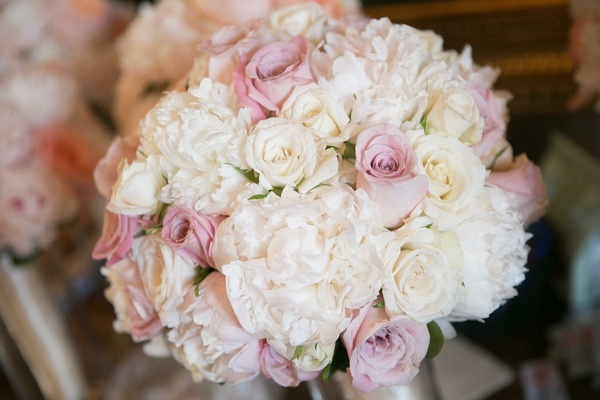 “I had an amazing wedding planner who handled all the difficult details, so my role in planning was mostly conceptual, which is the fun part!” enthuses the bride. 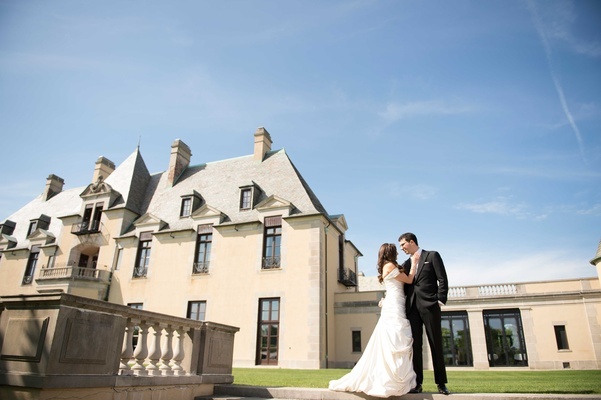 During their search for a venue in New York, “we fell in love with Oheka Castle when we saw it,” she admits. 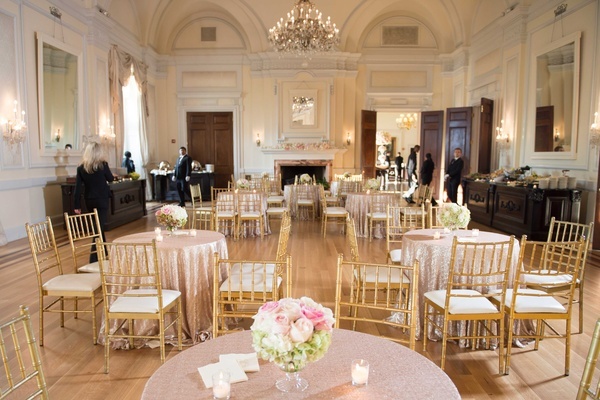 The stately setting provided the perfect backdrop for the celebration featuring a cream-and-pink palette with touches of gold, as well as an abundance of roses, that Helene had always envisioned. 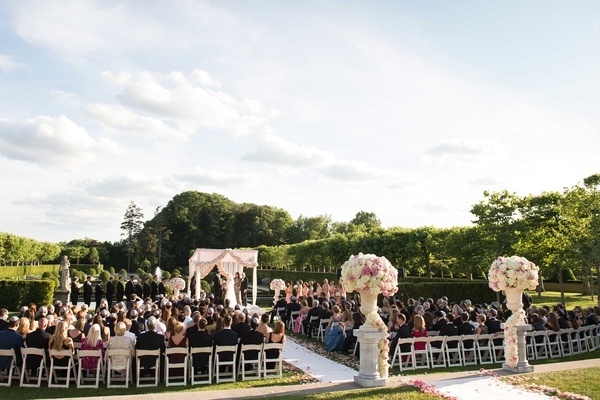 Before the vow exchange, the couple signed the ketubah in the presence of close family and friends – a memorable, intimate moment for the groom. 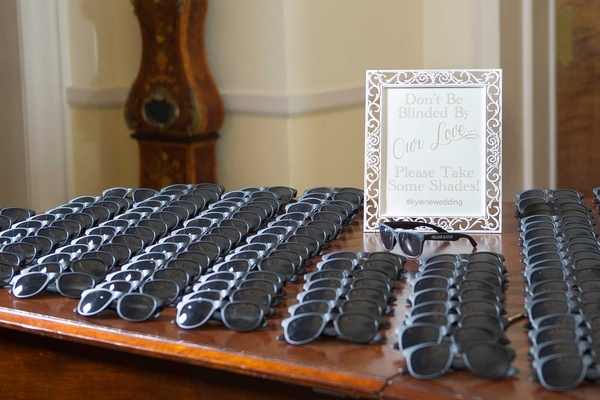 In preparation for the alfresco ceremony, sunglasses were available for guests as they filed in. 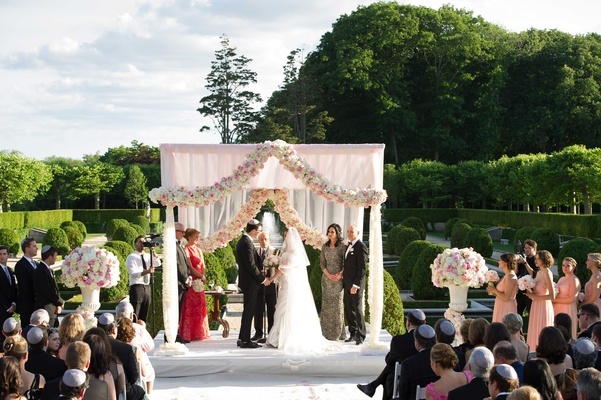 A chuppah draped in rosy fabric, adorned with a garland of white and champagne blooms, faced a breathtaking formal garden with reflecting pools and fountains. 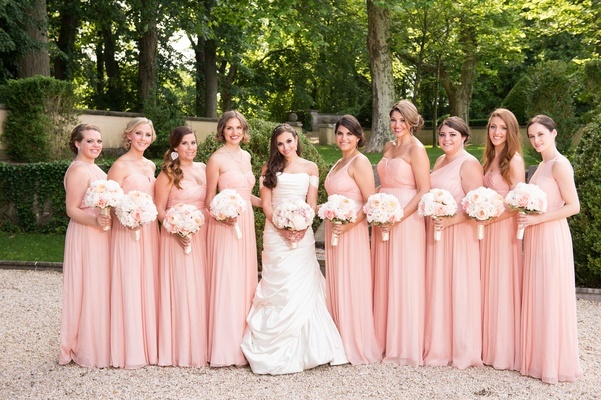 Following bridesmaids in flowing blush dresses featuring differing necklines were a special flower girl and ring bearer who delighted attendees – Helene’s grandparents. 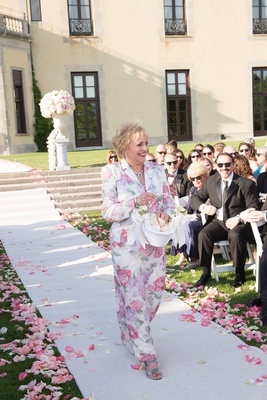 Her grandmother wore a floral ensemble, while her grandfather donned a pink tuxedo with shorts and knee socks. Apparently not a departure from his sartorial repertoire, “he owns a suit in every color, except black,” notes the bride with a smile. 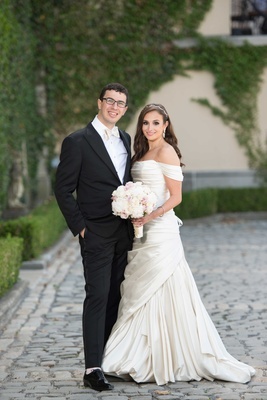 Helene made her grand entrance in a satin ruched gown with drop sleeves and bullion heels. A sparkly headband adorned her loose waves. 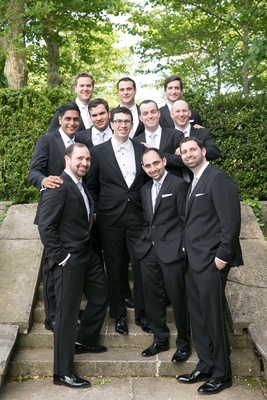 Kyle accessorized his classic tuxedo with an ivory bow tie, in contrast to his groomsmen’s silver ties. 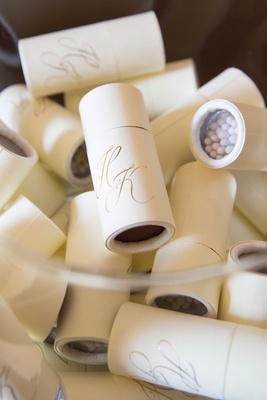 Exchanging the personal vows they had written was unforgettable for the groom. “It [was] an awesome experience,” shares Kyle. 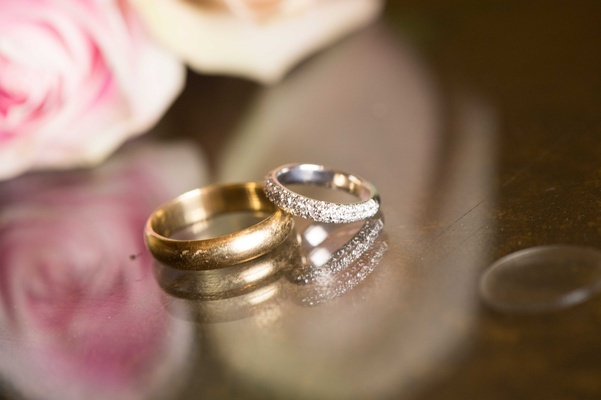 The bride then placed the wedding band that Kyle had inherited from his grandfather on his finger. 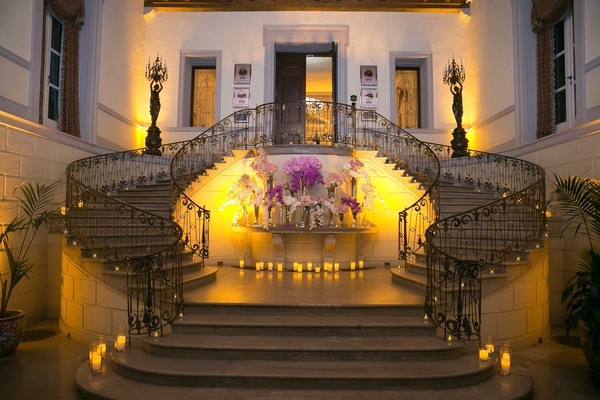 During the cocktail hour, 270 guests mingled in chic indoor or outdoor areas. 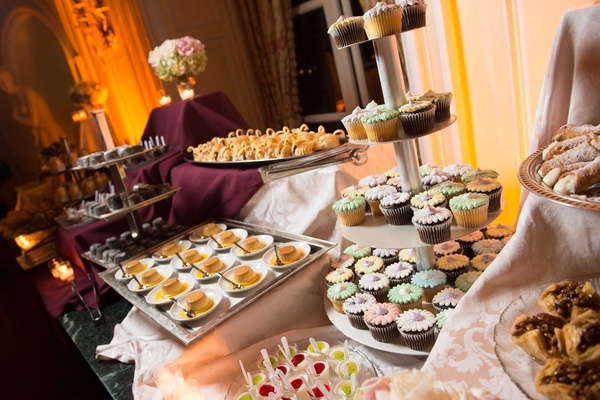 Among the available fare was a macaroni-and-cheese bar offering three varieties and an assortment of toppings. 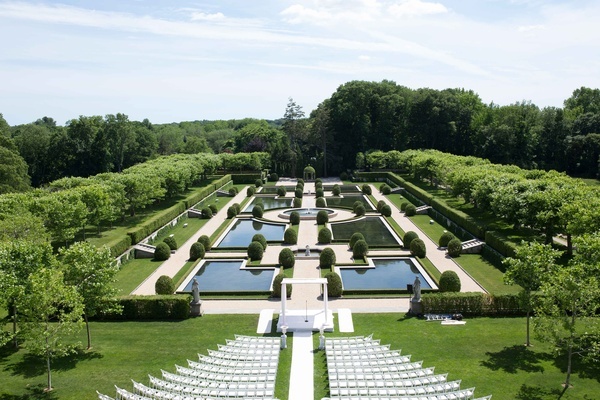 Loved ones entered an expansive ballroom with crystal chandeliers, a scroll pattern projected on the ceiling, and windows offering views of the verdant grounds for the reception. 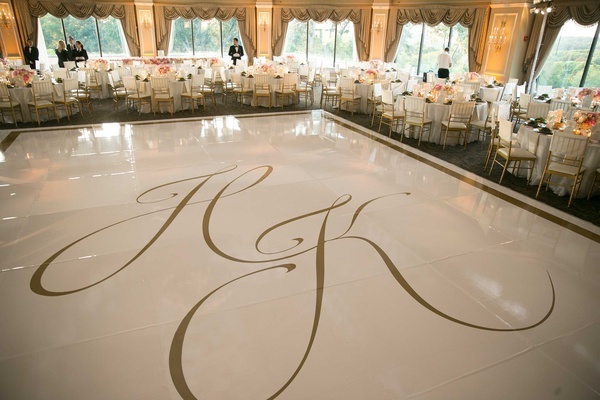 A glossy alabaster dance floor with the couple’s monogram in gold script commanded the center of the space. 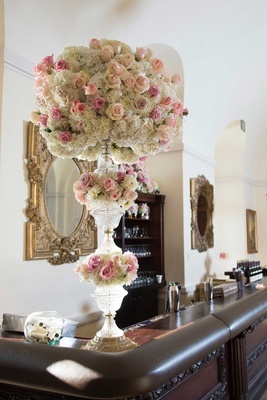 While continuing the romantic style of the ceremony, glamorous elements were incorporated into the reception. 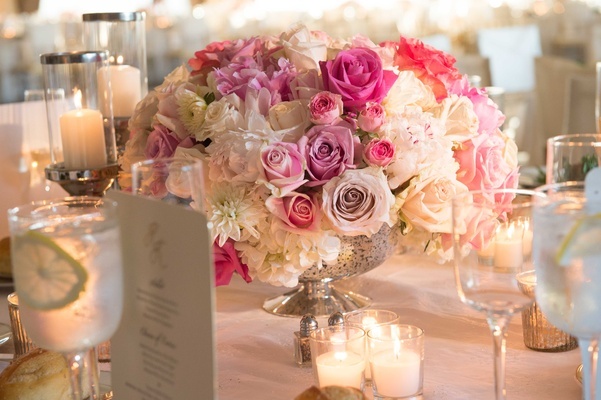 “My absolute favorite detail was the tablecloth [design],” reveals Helene. 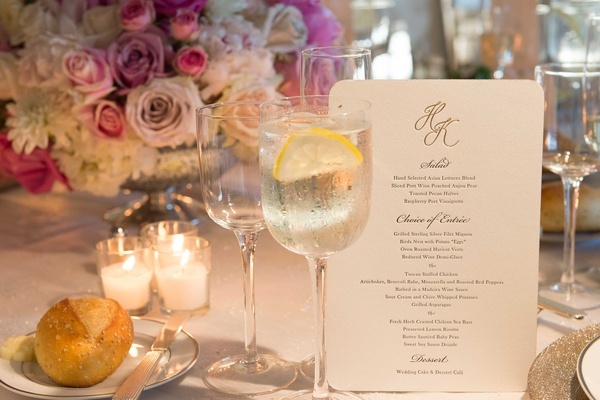 “It was a white [fabric] with a sheer overlay [showcasing] eye-popping crystals. 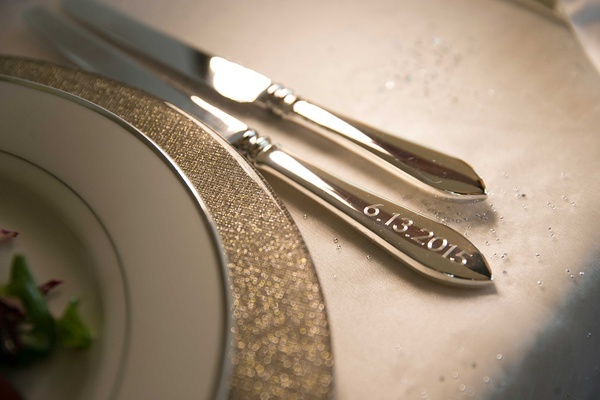 It was so elegant, yet subtle.” Chargers boasting shimmery gilt rims and flatware engraved with the wedding date further complemented the aesthetic. 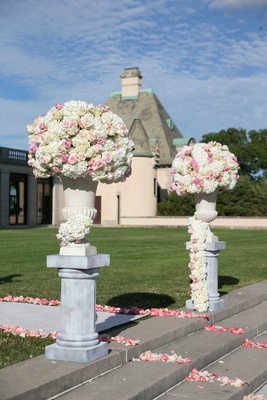 So as not to compete with the luxe linens and place settings, nor obstruct the views of guests, the bride and groom opted for simple, low centerpieces in silver mercury-glass vases composed of roses, hydrangeas, and peonies in vanilla and light and bright pink shades. 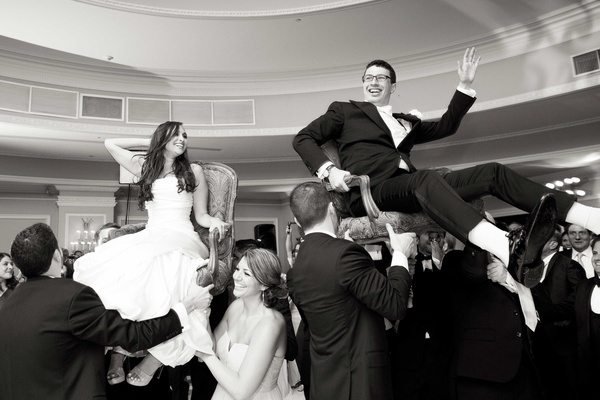 Establishing the tone for the lively festivities with their first dance, the newlyweds forewent a typical ballad and instead selected Michael Bublé’s upbeat rendition of “How Sweet It Is (To Be Loved By You).” “We were twirling, dipping, and having so much fun dancing,” reminisces Helene. 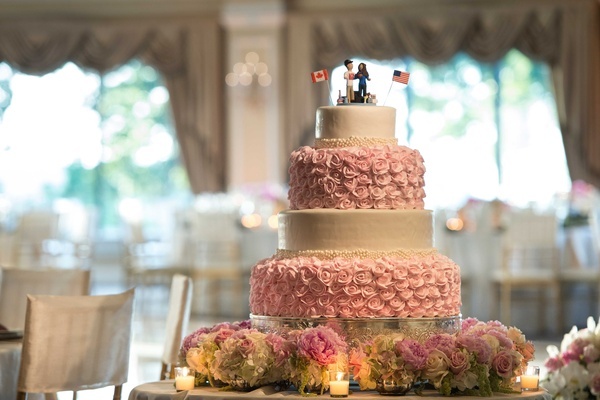 “I think it was a lot more fun for people to watch than the normal slow dancing.” They also expressed their playful nature atop the four-layer wedding cake embellished with pink sugar rosettes and pearls. Cartoon figurines of the bride and groom, standing next to flags representing their respective nationalities, were surrounded by some of their favorite things: shoes, a football, a box of cereal, and a ham. 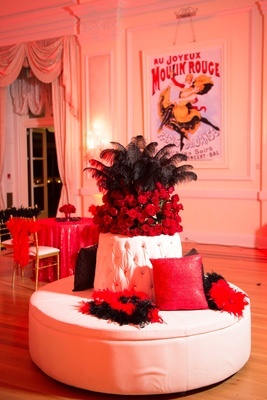 The merriment continued with a Moulin Rouge-themed after-party. 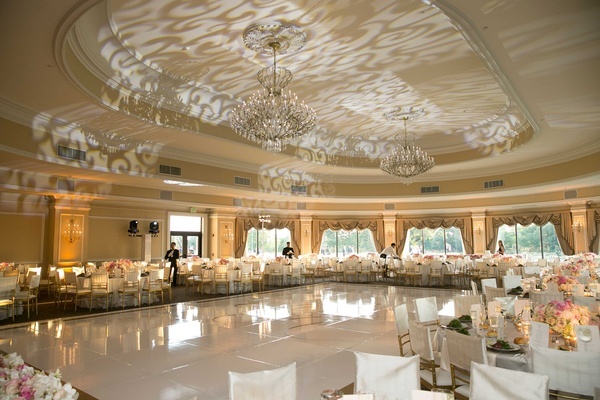 To create a club vibe, another ballroom was bathed in ruby lighting and outfitted with “funky furniture,” black feather boas, a striking Champagne tower, and a station where guests could capture their dance moves and have them transformed into flip-books. New York-style pretzels and hot dogs were also passed around to the revelers. 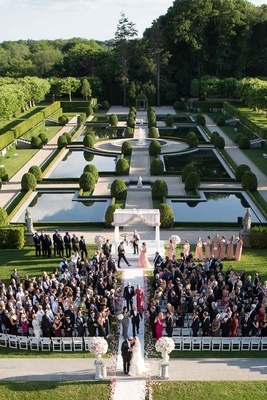 Helene would have only done one thing differently: “Take fewer photos. We took over two hours of pictures before the ceremony, most of which were just of the two of us. 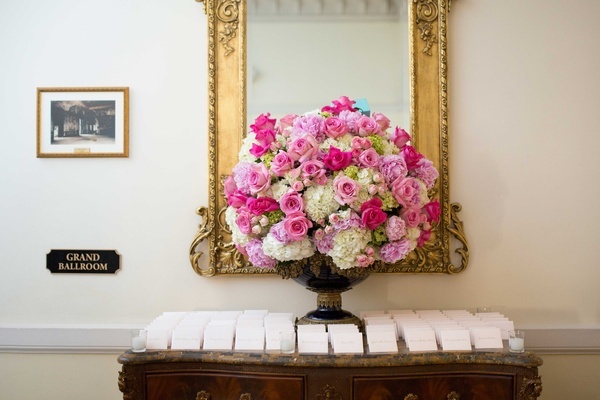 Taking tons of pictures that you don’t need is a great way to get tired and cranky before the wedding,” she laughs. Still, she says, they had the best night of their lives.